The sun might not be shining right now, but maybe our special sale will make you smile! From now until Sunday (17th June) we have a huge 60% off many of our national and provincial directories for Ireland. That includes such essential titles for family historians as Slater’s, Pigot’s and Thom’s. If that wasn’t enough, we also have 60% off Lewis’s Topographical Dictionary of Ireland and The Parliamentary Gazzetter of Ireland. This means that you can buy our most popular titles for a fraction of their usual price! We have three new Irish Titles for you this newsletter. This includes Bram Stoker’s first book, to coincide with with our research into Bram Stoker’s family history and the launch of findmypast.ie of 2 million more Petty Sessions records. 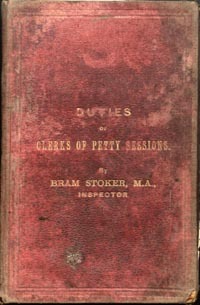 Bram Stoker, The duties of Clerks of Petty Sessions in Ireland, 1879. This was Stoker’s first book, a guide to the workings of the Magistrates’ courts in Ireland. 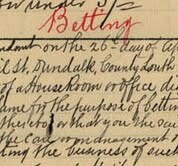 Return of Requisition Forms showing the Name and Address of Persons of the Belfast Union, 1888. (Download). This important list of over 500 residents of Belfast Union was compiled to assist the creation of an accurate voters register. This is a very valuable resource for anyone trying to trace ancestors in the Belfast Union prior to the 1901 Census. John Gibbons, Tramping through Ireland, 1930. Witty, observant and most of all honest, John Gibbons’ Tramping through Ireland, will delight readers now as it did over 70 years ago. We also have three new British titles this newsletter: Wills and Administrations at Canterbury 1640-1650 (Downlaod); Willingham Franklin Rawnsley and Frederick L. Griggs, Highways and Byways in Lincolnshire, 1914 and Walter Jerrold and Hugh Thompson, Highways and Byways in Middlesex, 1909. New enhanced genealogy service now available, as the National Archives and the National Library of Ireland award tender to new Consortium. 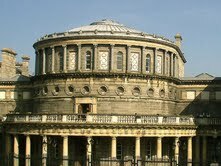 The joint consortium of Eneclann and Ancestor Network are delighted to announce that they will provide genealogy services in the National Archives of Ireland and the National Library of Ireland in the coming year, following a competitive tendering process. The Consortium has increased the number of genealogy experts delivering the service, to provide a wide and comprehensive range of expertise to anyone looking for help and advice in tracing their family history. 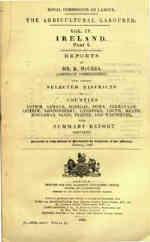 Longford is covered by a range of directory titles, including Pigot’s and Slater’s Leinster sections. The poor law union of Ballymahon is included in the Agricultural Labourer Part I, which offers a fascinating insight into a class of Irish life that was slowly disappearing. County Roscommon is also covered by Pigot’s and Slater’s directories, Connaught sections as well as a few more unusual publications. These include Rev. Francis Burke’s Lough Ce and its Annals – a history of the annals as well as chapters on specific events, places and people. The Crofton Memoirs provides valuable source material for any researchers interested in either the history of the Crofton family or in the early modern history of the east Connaught region. Amongst the last of the series published in 1832, the 800 page Statistical Survey of the County of Roscommon is one of the longest and most detailed of the series. Both Longford and Roscommon, as well as the other Irish counties, are covered by the Census Reports. These publications contain detailed statistical information collected from the census returns prior to their destruction. The statistics included include information right down to townland level, and so are excellent resources for those of you with an interest in local history before and after the Famine. View our full range of titles for County Longford or visit the Eneclann shop to see what we have for your county.